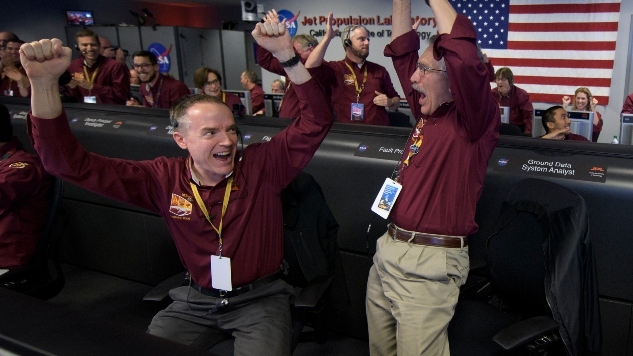 On Monday, the NASA Mars InSight lander entered, descented and landed safely on the Red Planet. The $830 million dollar robot is designed to study the deep interior of Mars. That’s just what’s up in the universe—meanwhile, the Twitterverse has been active nonstop. Under the hashtag #MarsLanding, comedians and space nerds (and comedic space nerds) have been delivering some quality content online. I come bearing some good news, and some bad news. The good: Thirty Seconds to Mars retweeted InSight’s first snap from Mars. The bad: Bruno Mars missed the viral Tweet opportunity of a lifetime by remaining silent on the matter. Without further ado, here are the funniest Tweets from Monday’s Mars landing (and thankfully, none of them are that dumb joke “When do astronauts have lunch? At LAUNCH TIME!”).